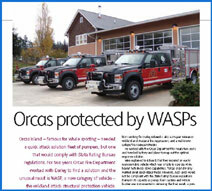 Orcas island acquires fleet of quick attack pumpers. Read more by downloading the article at HemmingFire.com. A knowledgeable source for the best in first responder equipment, tools, and gear, Hempfield Fire Equipment, LLC is ready to serve your needs both today and tomorrow.